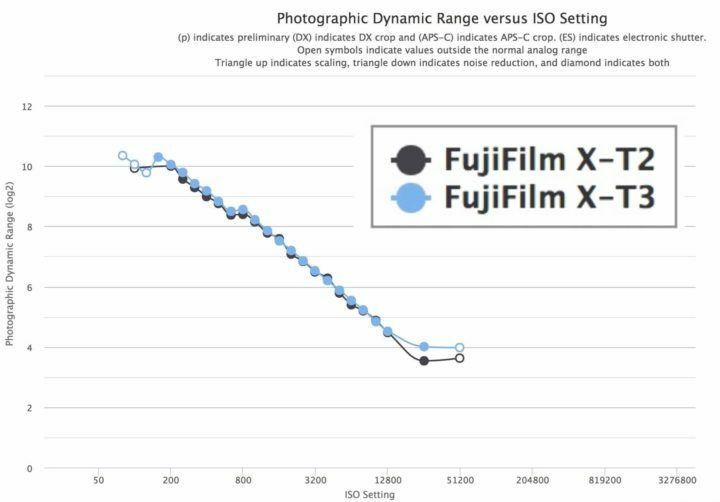 Photons to Photos just published their dynamic range results for the Fujifilm X-T3. According to their data measurement, there is no noticeable difference between the Fujifilm X-T3 and X-T2. The Fujifilm X-T3 has a little advantage at base ISO, especially thanks to the base ISO 160 and also at very high ISO. We have seen from previous comparisons, that the Fujifilm X-T3 preserves more details at high ISO. You can manipulate the chart here. From my testing of the X-T3 at photokina, I can say that AF speed, face/eye AF and video are the real reason you might want to upgrade to Fujifilm X-T3. Follow FujiRumors on Facebook, Instagram, RSS-feed and Twitter. 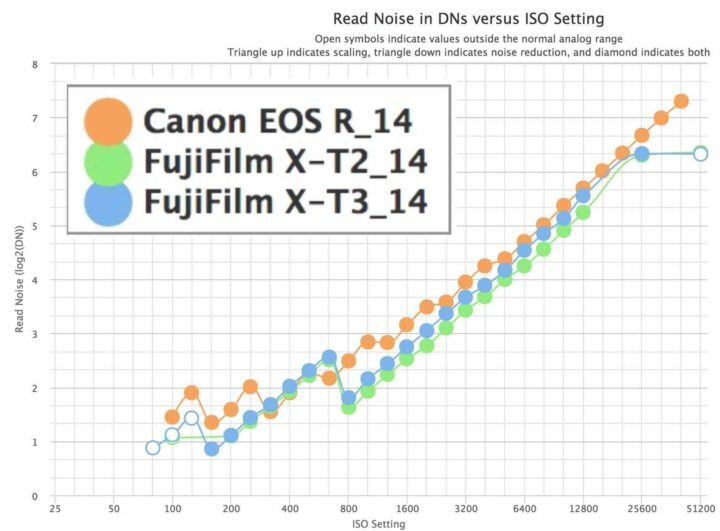 Photons to Photos just published their Fujifilm X-T3 read noise measurement results. You can see the Fujifilm X-T3 above compared to the Fujifilm X-T2 and Canon EOS R.
NOTE: These raw values are not appropriate for comparing camera models because they are not adjusted for gain or area. Fujifilm X-T3: Are 2/3 Stops Better Low ISO Dynamic Range Compared to X-T2 Realistic? A few days ago, DPReview published their Fujifilm X-T3 studio lab test shots, and as to expect, the FR-community had lots to discuss. 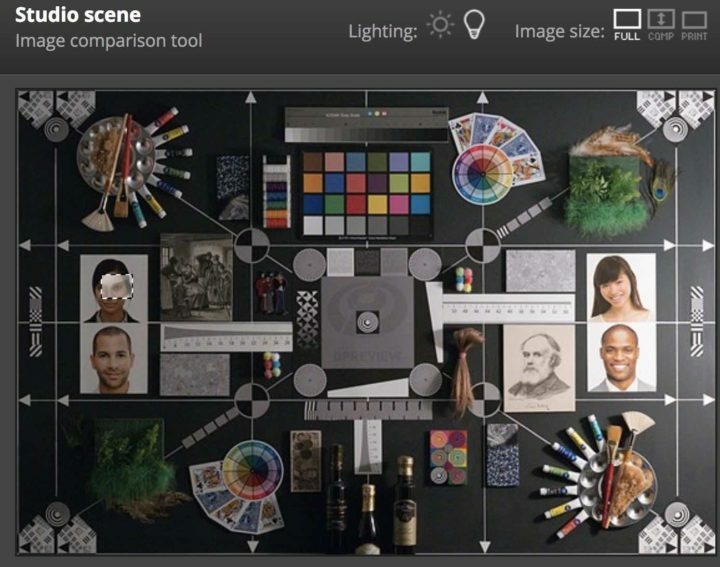 Keep in mind that DPReview used a non final BETA version of Adobe with X-T3 support. DPReview says the will re-check the ACR performance before making any final conclusions. In the comments to the lab test article, some FR-reader observed certain improvements on the Fujifilm X-T3, that at the end could give us 2/3 stop better dynamic range over the X-T3. I will share their feedback below, as well as some of my observations. As you know, you can charge the Fujifilm X-T3 using a USB-C battery pack. Well, AmazonUS has now a 1 day deal running on Fujifilm recommended external batteries. You can find them both at 50+% off. Not only the Fujifilm X-T3 can be charged via USB even while the camera is turned on. 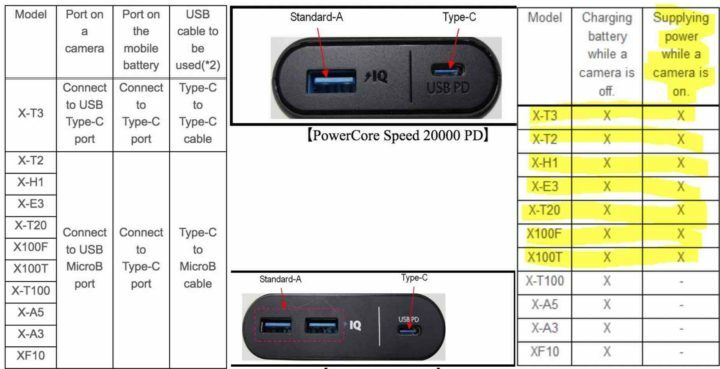 This Fujifilm page shows that also the X-T2, X-H1, X-E3, X-T20, X100F and X100T can be USB-charged while ON. And the recommend the Anker PowerCore+ 26800 PD and Anker PowerCore Speed 20000 PD, which today only are 50+% off. Dylan Goldby compared the performance of three “older” Fujinon lenses on the Fujifilm X-T3 and Fujifilm X-T2. XF 35mmF1.4 (min 3:18 on X-T3 and min 4:44 on X-T2): Used on the X-T2, it takes more time to lock focus and hunts more. On the X-T3 it is definitely faster and no hunting. Face/Eye detection (min 12:59): works very well. Only thing when the person moves out of the frame, then gets into the frame again from a different distance, then it needs more time to find the face again. Check out the full video at Dylan Goldby Youtube.